Christian Virtues Fruitful Life are desirable “cause-and-effect” proclamations! The question, “What is a Christian?” is often heard and is very often followed by criticisms of various natures. Answers in abundance can be found by study of the Holy Bible. Paul, in Galatians 5:22-23, describes the Holy Spirit, who lives inside every believer, in terms of “fruit.” The fruit is the product of the Spirit and is produced by the Spirit rather than by the Christian. 23Meekness, temperance: against such there is no law. Galatians 5:22-23. The Bible clearly proclaims that all receive the Holy Spirit the moment they believe in Jesus Christ. A primary purpose of the Holy Spirit entering a Christian’s life is to change that life. The Holy Spirit’s goal is to conform us to the image of Christ, and in doing so make us more like Him. 22But the fruit of the Spirit is love, joy, peace, longsuffering, gentleness, goodness, faith, 23Meekness, temperance: against such there is no law. Galatians 5:22-23. 8So then they that are in the flesh cannot please God. 9 But ye are not in the flesh, but in the Spirit, if so be that the Spirit of God dwell in you. Now if any man have not the Spirit of Christ, he is none of his. Romans 8:8-9. 13 For by one Spirit are we all baptized into one body, whether we be Jews or Gentiles, whether we be bond or free; and have been all made to drink into one Spirit. 1 Corinthians 12:13. 13 In whom ye also trusted, after that ye heard the word of truth, the gospel of your salvation: in whom also after that ye believed, ye were sealed with that Holy Spirit of promise, 14 Which is the earnest of our inheritance, until the redemption of the purchased possession, unto the praise of his glory. Ephesians 1:13–14. 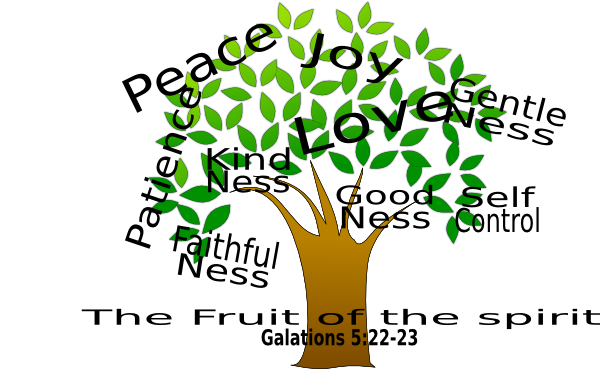 The fruit of the Holy Spirit directly contrasts with the sinful nature acts described in Galatians 5:19-21. Sinful flesh produces fruit which reflects our nature, and the Holy Spirit produces fruit which reflects His nature. 19 Now the works of the flesh are manifest, which are these; Adultery, fornication, uncleanness, lasciviousness, 20 idolatry, witchcraft, hatred, variance, emulations, wrath, strife, seditions, heresies, 21 Envyings, murders, drunkenness, revellings, and such like: of the which I tell you before, as I have also told you in time past, that they which do such things shall not inherit the kingdom of God. Galatians 5:19–21. 9But he that lacketh these things is blind, and cannot see far off, and hath forgotten that he was purged from his old sins. 11For so an entrance shall be ministered unto you abundantly into the everlasting kingdom of our Lord and Savior Jesus Christ. 2 Peter 1:5-11. 1Scripture taken from the Holy Bible, Zondervan Study Bible, Large Print, King James Version (KJV); copyright 2002 by Zondervan; published by the Zondervan Corporation, Grand Rapids, Michigan; All rights reserved.